The molten-aluminum is maintained at constant temperature by heating with CERACO HEATER® (an immersed electric panel heater). Each chamber is heated and controlled separately with CERACO HEATER®s, so that the power consumption can be decreased. Due to the closed-type, it inhibits the formation of metal oxides. Accordingly, the clean molten metal can be supplied from the furnace. 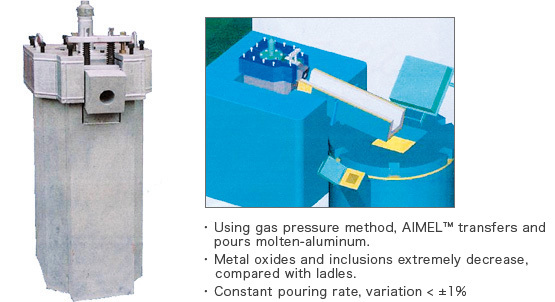 A degasser or a filter can be set to purify the molten aluminum. This immersion type heater can efficiently transfer heat to the molten metal, so that power consumption is reduced significantly compare with a heater heating from outer or upper side. It can be replaced even during operation in the molten metal. Temperature is maintained uniformly throughout the molten metal and therefore formation of metal oxides can be inhibited. The heater is high power and long life　because it is made of ceramics. The panel case is made of NICACERACO®. Therefore, it has high corrosion-, thermal-shock-, and crack-resistance. So the heater has excellent durability. The molten metal is kept at high temperature during transportation. Keeping the empty ladle warm by large heat-accumulation. It is easy to clean the ladle. Refractory is not damaged. In this sensor system, first, ceramic pipe is put into the molten metal and an inert gas is supplied there, and then changes of pressure are converted into electrical signals. Thus, the system can indicate the level of the molten metal digitally. By using various types of outputs, different interlocks are available. The system can be used for various applications, such as indication of the time to supply the molten metal into a furnace, full level signals, warning signals, etc. “System Sensor ™” for low-pressure casting furnaces is now under development for the market. Portable immersed heater for heating and warming molten aluminum. It is easy to set, remove and handle. So, it is suitable to use as a spare heater for heating molten aluminums in case of emergency or etc. Using a temperature controller, temperatures of molten aluminum are controlled. Portable temperature controllers are also available.